This is the first of a series of articles on CCTV cabling. - How to make your proposal the best option for your customer, simply by choosing the right cabling. When you shoot a video with your smartphone, images are captured by smartphone's camera, recorded in its memory and displayed on its screen. If you want to view recorded images, you can pull them from internal memory, display on smartphone's screen or extract them to an external computer or even send them to someone over the Internet. Any resemblance to a CCTV system ? In fact , the similarity is great; Your smartphone does everything a CCTV system does: capture, record and display images , all concentrated in a single device. And you can save imagens at the maximum permitted resolution by the smartphone camera, with no delay, no loss of quality or resolution. But, where similarities with a CCTV system end? - In a CCTV system there are multiple cameras, all far from the record / monitor device. So the biggest difference between a smartphone and a CCTV system is that the latter has an additional component : the CABLING.. But what would be the best definition of cabling for a CCTV system ? It is understood by the other end where the images are being recorded and / or displayed . 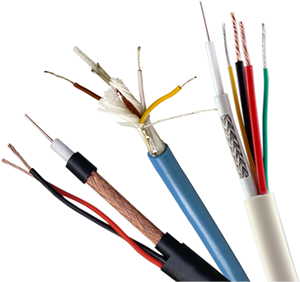 In a better definition, cabling can be formed only by coaxial cables and BNC connectors ; UTP cables, connectors and baluns ; fiber optic cables and converters or, in an IP system, UTP cables, connectors and switches. Not forgetting the electrical cabling, which has the function of bringing power to the cameras . What is the major challenge in an installation ? Unfortunately, due to physics' laws, we know that this does not occur; there are components along the way to go that reduce, degrade and even delay the original video signal sent by the camera. What matters in a facility is the final result , what will be displayed and recorded. There's no point using a camera with 800 lines of resolution if you will only get 400 lines at your monitor, because part of this resolution was lost in the cabling ; no use sending an image with a 30 fps rate if only 5 fps reach the destination. In CCTV, cabling is only a supporting system. Once installed, no one should remember it. However, if poorly chosen, it can seriously compromise the performance of a system.